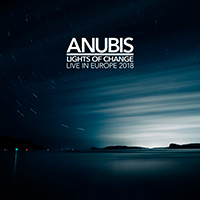 “Lights Of Change“ the new Anubis album is their second live album and their seventh album in total. The Australian Progressive Rock band Anubis was touring in Europe last summer (2018). This double CD is recorded at two stops along that tour. The first disc is almost the complete set from the band’s much talked about festival performance at Loreley Amphitheater in St. Goarshausen, Germany on July 15 2018. The second disc is taken from the band’s sold out performance at the small venue t’Blok in Nieuwerkerk a/d IJssel, The Netherlands on 8th July 2018. A gig organized by the boys of Prog Frog. This disc features a full live performance of the band’s critically acclaimed second album, the concept piece “A Tower Of Silence. An album that opened the gateway to a whole new fan base in Europe. The double CD is packed in a 6 panel digipak and released independently on the band’s own Anubis Music label. As you could read above, disc one was recorded at the famous Loreley Amphitheater in St. Goarshausen, Germany during the wonderful Night Of The Prog festival (2018 edition). I remember that hot afternoon at the Amphitheater very well. Your reviewer was standing front row when the band opened the Sunday, the last day of the 3 days festival. The set featured pieces from the 2017 studio album “The Second Hand“ plus the stage favorites “Dead Trees“, “Silent Wandering Ghosts“ and the epic “Disinfected and Abused“ from their debut “230503“ album. For people that were there this disc alone is the perfect souvenir. You will recognize the energy that was exchanged between the band and the audience. It was nice to witness that people who didn’t knew the band before and maybe entered the Amphitheater just after the band started were immediately attracted by what they heard and came forward quickly. The band played in front of the largest audience the band had yet played to. It was a great gig with a lot of energy and your reviewer enjoyed it very much. Disc one is a beautiful live document of that hot Sunday afternoon in July 2018. The second disc is taken from the band’s performance at a little Dutch club (‘t Blok) in Nieuwerkerk a/d IJssel, The Netherlands. The gig was organized by ProgFrog an initiative of a little group of (Prog)friends that with the help of some sponsors manage to organize Prog gigs on a Sunday afternoon. The entree fees are low but are going directly to the band. An amazing initiative and a lot of Prog fans witnessed great gigs over there of (foreign) bands who are getting the opportunity to present them to the Dutch audience. Personally I visited the club for some great Italian and German bands. Somehow I missed the gig of Anubis in that wonderful place. So I am very happy with this release. I hear you think, nice story but what about the music. Well the band has developed an own style that could be categorized as a Symphonic Progressive style with influences of the early 1970’s. So expect lots of Analog synths, Hammond organ and Mellotron carpets and melodic and soaring guitar solo’s. On top of that the band is blessed with a great vocalist who has a characteristic voice. The music is melodious and has also some Neo-Prog and ArtRock influences. In fact the band was for years the best kept (Prog) secret from Australia. But certainly because of their great performance at the prestigious Night Of The Prog festival in 2018 the road to build a bigger fan-base is completely open. And the band deserves this. Please buy your personal copy of this album to support the band ... you won’t be disappointed. This great live document is highly recommended by progVisions.